Selling tea over the internet isn't the simplest proposition. There's no way for online consumers to smell or taste a delicate chocolate chai or a bold pi lo chun green before they place an order. "A fair amount of guesswork is involved," admits Ilya Kreymerman, chief technology officer at Adagio Teas. The cumulative result of Adagio's social media efforts has been steady growth in sales--up about 300 percent since 2004--as well as dramatic reductions in advertising costs. But the folks at the 13-year-old company, which operates online and from three stores in the Chicago area, don't like to leave their internet customers guessing. Instead, Adagio's patrons are encouraged to offer recommendations through Facebook, Twitter and Google+. And the conversation doesn't end there. Adagio is on the leading edge of a movement toward extracting actionable data from the social media stream, cultivating insights about products and trends from its robust customer community. 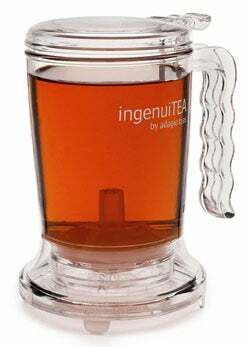 Simple cuppa: Place Adagio's IngenuiTea teapot atop a cup; the tea flows downward, while the mesh filter retains the leaves. Reviews are the cornerstone of the strategy. Unlike most companies, Adagio doesn't filter comments from its consumers: All statements, positive or negative, make the boards. The level of transparency this provides benefits Adagio in the form of valuable market research. "If we have great reviews and poor sales, it may be a case of the tea not getting enough exposure, and we may choose to sell it a bit longer. But if a tea is receiving poor reviews and it isn't selling well, we will probably kill it off," Kreymerman says. Already there are plans to eliminate six to eight teas over the coming months as a result of lackluster customer reviews. Positive comments, meanwhile, have been seen to drive sales. The influence of social media even crosses over into Adagio's brick-and-mortar world. Video monitors in the company's shops display a live feed of customers' tweets and Facebook posts about the teas, as well as foursquare check-ins at any of its locations. "The idea is to give people a sense, as they walk through the stores, that there's a larger community out there that likes the brand," Kreymerman says. Further activating customers, Adagio offers tea-related blogs and discussion groups in which users can share information through Gmail and by clicking social media buttons. Its website promotes friends' selections and preferences and provides point rewards toward free products. Friends can also send each other discount coupons through social media; the sender receives a reward when the coupon is redeemed. Adagio has spurred interaction in other ways, too. Its Signature Blend program lets aficionados create a tea blend, name it and share it with friends via Facebook, Twitter and e-mail; other customers can view the blend along with the creator's name at the website. When someone buys it, the creator receives points that lead to a gift certificate. User-created blends now account for 5.5 percent of Adagio's online tea sales. The cumulative result of Adagio's social media efforts has been steady growth in sales--up about 300 percent since 2004--as well as dramatic reductions in advertising costs. As Kreymerman says, "Social media has been our ticket to success."